The mirror-like waters of the largest glacial lake in Slovenia make Bohinjsko Jezero one of the most popular tourist attractions in the country. Your day-by-day itinerary now includes Waterfall Savica, Triglav National Park and Lake Bohinj. Kick off your visit on the 28th (Fri): admire the sheer force of Waterfall Savica, then contemplate the waterfront views at Lake Bohinj, then explore the striking landscape of Triglav National Park, and finally see the interesting displays at Oplen-Hof. For more things to do, maps, ratings, and other tourist information, you can read our Bohinjsko Jezero travel planner. Ceske Budejovice, Czech Republic to Bohinjsko Jezero is an approximately 5.5-hour car ride. You can also fly. On the 29th (Sat), you're off toBled. 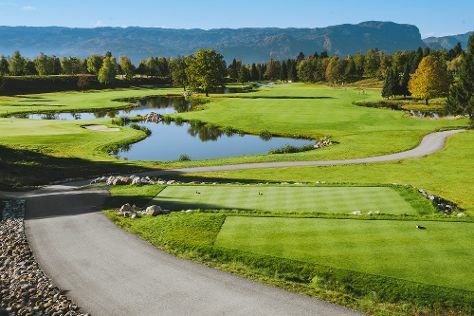 On the 29th (Sat), step into the grandiose world of Bled Castle (Blejski Grad), then pause for some serene contemplation at St. Martin's Parish Church, and then play a few rounds at Royal Golf Bled. To see other places to visit, photos, maps, and tourist information, read Bled vacation trip planner. Bled is just a stone's throw from Bohinjsko Jezero. In July, daily temperatures in Bled can reach 31°C, while at night they dip to 17°C. Cap off your sightseeing on the 29th (Sat) early enough to go by car to Bovec. Bovec is a town in the Littoral region in northwestern Slovenia, close to border with Italy. On the 30th (Sun), snap pictures at Bridge of Napoleon, explore the activities along Soca Valley, and then relax and float downstream with a rafting and tubing tour. To find more things to do, reviews, and more tourist information, read our Bovec itinerary builder. You can drive from Bled to Bovec in 1.5 hours. Alternatively, you can do a combination of train and bus. In July, daytime highs in Bovec are 28°C, while nighttime lows are 15°C. Wrap up your sightseeing by early afternoon on the 31st (Mon) to allow enough time to drive to Piran. 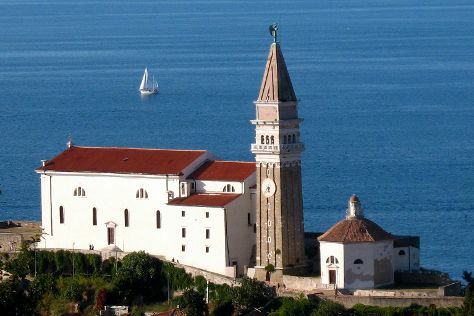 To see ratings, maps, reviews, and tourist information, read our Piran tour planner. Traveling by car from Bovec to Piran takes 2.5 hours. Alternatively, you can do a combination of taxi, train, and shuttle; or take a bus. Traveling from Bovec in July, expect Piran to be somewhat warmer, temps between 34°C and 21°C. Cap off your sightseeing on the 1st (Tue) early enough to go by car to Postojna. With its friendly atmosphere, breathtaking landscapes, natural phenomena, and historical monuments, Postojna offers everything you need for a peaceful vacation or a quick getaway from the city. Kick off your visit on the 1st (Tue): explore the fascinating underground world of Postojna Caves and then explore the historical opulence of Predjama Castle. To find traveler tips, reviews, ratings, and tourist information, refer to the Postojna sightseeing planner. You can drive from Piran to Postojna in an hour. Alternatively, you can take a bus; or do a combination of shuttle, bus, and train. Prepare for a bit cooler weather when traveling from Piran in August: high temperatures in Postojna hover around 30°C and lows are around 15°C. Finish your sightseeing early on the 1st (Tue) so you can drive to Ljubljana. For photos, maps, and tourist information, you can read our Ljubljana trip itinerary planner. You can drive from Postojna to Ljubljana in an hour. Other options are to take a train; or take a bus. In August, daily temperatures in Ljubljana can reach 30°C, while at night they dip to 15°C. You will have some time to spend on the 2nd (Wed) before leaving for home.